Is there any way of defining a default method instead of annotating with NotifyPropertyChangedInvocator in Resharper? 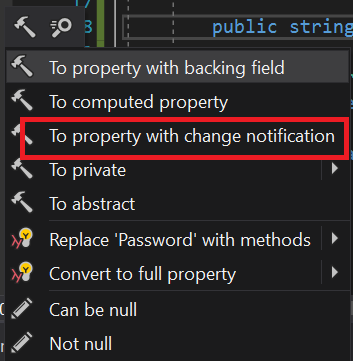 Resharpers provides quite handy feature To property with change notification from property Action Menu for transforming an auto-property code into the one explicitly calling SetProperty-like method. However, currently (as of version 2018.1.4) it's not so handy. The thing is that for having that thing work the class I am defining the property in must have explicit method annotated with [NotifyPropertyChangedInvocator]. In my code I usually use already implementing INotifyPropertyChanged classes, for example, MvxViewModel from MvvmCross. So, this is an additional (empty) step, which brings additional complication in my code, decreases performance and makes the binaries to grow. (It's not a crucial, of course, but still it's involved just for the development convenience rather than any functionality). So, is there any way to define in Resharper settings (or anywhere else) the default method which Resharper can use for performing such transformation automatically on the classes which already have INotifyPropertyChanged implemented? P.S. It seems like quite long time known issue, as it discussed here, so wandering if there is still no solution for handling this situation. Browse other questions tagged visual-studio resharper inotifypropertychanged action-menu or ask your own question. Fastest way to update namespaces with ReSharper? Can resharper navigate to a method? Resharper Annotations on a delegate method? Is there a way to disable ReSharper for a specific file? Is there any way to make ReSharper folder's “Namespace Provider” property to false by default?